A medical charting station sounds like a pretty high end technical workstation, but for the longest time, it simply meant a wooden or metal cabinet or desk built into a wall of a clinical room that held physical medical charts. It was space efficient, yes, but hardly any wonder of modern discovery. They did think to put locks on them, so the old timers at least get points for patient privacy there. Once computers became cost effective and small enough, health facilities started cramming them into those cabinet work spaces whose openings strikingly resembled the seat-back tray tables on airlines. As quickly as they could, medical charting practices advanced onto sophisticated electronic medical records software platforms. Though the paper charts were a thing of the past, the computer systems that accessed the EMRs were about as flexible as having your laptop propped up on that airline tray table. The next evolution for the medical charting station is now the use of medical computer arms married with a folding IT station. Adjustability, dexterity, durability, and space efficiency create a winning combination that medical practices seek out in their medical computer equipment. The Tangent Easy-Fold IT Station with medical computer arm offers its users customized configuration options to mount a flat panel display, keyboard and computer conveniently to a wall for maximum flexibility and ergonomic performance. The features on the medical arm system are numerous and impressive. The entire system easily folds back to less than 9 inches (22.9cm) from the wall and users can adjust from sitting to standing in one fluid motion. The adjustable arm helps to position the monitor and keyboard for maximum productivity for care providers who are on their feet all day and also to allow patients to see the screen without having to move or strain themselves. This has been helpful to me at the dentist’s office when they wanted to show me my x-rays while I had a suction tube in my numbed mouth. Better that they moved the monitor to my level, lest I haplessly drool all over their equipment. There is 17 inches of overall vertical adjustment range on the medical computer arm that can accommodate users of any height, and they can easily lock that adjusted computer height in place to avoid sudden movements or accidents. The monitor itself has 6.5 inches of independent height adjustment and the keyboard folds up to sit flush with the system when it’s pushed back to the wall. More features include optional CPU mounts, VESA 75/100 mounting options, and trays for items like barcode scanners or computer mouses. The construction of the Tangent Easy-Fold IT station and medical arm is of durable aluminum and, being of medical grade, comes with a sealed keyboard tray for better infection control. 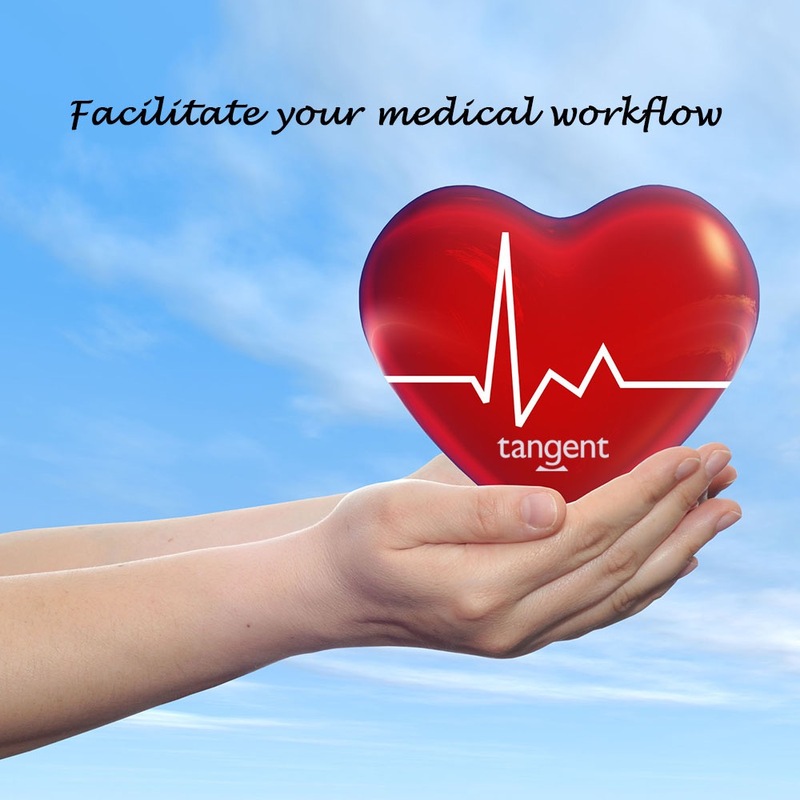 Tangent protects most of their computer products with antimicrobial additives or constructs them to withstand heavy cleaning for patient safety and hospital compliance. Coupling a medical purpose built Tangent computer system with an IT workstation and medical arms of this nature provides a high degree of assurance in both safety and flexibility.